Ahh, it’s my favorite time of the year again. Trees turning color, leaves falling, weather cool enough for a light jacket, etc. This past Wednesday, we had a day outing at work where our whole group went for a canoe trip down the St. Croix River just northeast of the Twin Cities. It happened to be just about the only sunny and rain-free day of the week, so it was a good time. Nothing like getting paid for a day of leisurely canoeing with beer and grilled food on a sandbar along the way. Joanne seems to be finally past the morning-sickness stage of pregnancy, so life is a lot easier around the house, at least for the time being. I’m also feeling a lot more like cooking lately, which is good for both of us. I generally really enjoy cooking good meals, but I don’t get the urge nearly as much in the summertime. I guess that’s another nice thing about the arrival of Fall. I’ve starting hacking quite a bit on Dodji’s GNOME debugger Nemiver lately. It’s coming along quite nicely and is fairly usable already (not that I can claim much credit for that). Now that there’s a gtksourceviewmm release it should be a bit easier for others to build as well. I’m also planning to make a new release of Agave very soon as well, since I’ve gotten a few new translations lately. If anybody else wants to send a translation my way, feel free. We got back from a nice long weekend trip to Milwaukee (another of the great but underappreciated cities of the midwest) visiting my sister and her family. It was a good trip and I got to see my newest niece for the first time. After getting back home I noticed that we had quite a few Cayenne peppers hanging on the bush in our back yard. 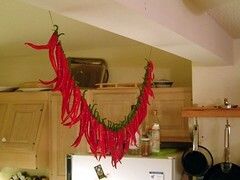 So I picked a few and strung them up in the kitchen to dry. I think we’re going to dry them, grind them up, and try to make them into a hot pepper sauce. If anybody knows how to make a good hot pepper sauce, let me know.